Happy Halloween - from Punky & Daisy! You know I love it when my customers share pictures of projects they make using my patterns. Well, look at this little cutie - just in time for Halloween! Maryann M. sent me this picture of Poor Lil' Punky - isn't he cute?! I love all of her fabrics, but really wish I had some of that piece that's in between his eyes. Fun! We had a little pumpkin carving party last weekend - you can see that some of us (not really us, I didn't make one because I can't be trusted with sharp objects!) put in a little more effort than others! Here she is when she was still a garage kitty! She likes sleeping here - it's so nice and toasty! Nothing like getting into your food...literally! Awwww...she often sleeps with her tongue out! Ozzie and Callie hated her when she first came in. They both growled and hissed at her constantly. After a day or two, we could tell that Callie really wanted to play with her, but didn't make a move just yet. But, she loves to swish her tail at Daisy - very nonchalant, like she's not really playing with THAT KITTEN. I have pictures of CC doing this with Callie when she was a kitten! Ozzie still growls at her, and doesn't play with her, but he is tolerating her a little better - as in - he doesn't growl as loud or as often! Gotta go - Daisy is here, trying to walk on the keyboard - maybe she has ideas for her own blog post? Patriotic Pineapple - from wall hanging to HUGE! I LOVE hearing from my customers! Yesterday I received an email from Jenny Waller, saying that she had purchased my Patriotic Pineapples pattern at the Springfield, MO show last September. She made a few blocks, then a few more...then 945 blocks!!!!!!! Which equals 34,965 pieces!!!!! HOLY PINEAPPLES!!!! 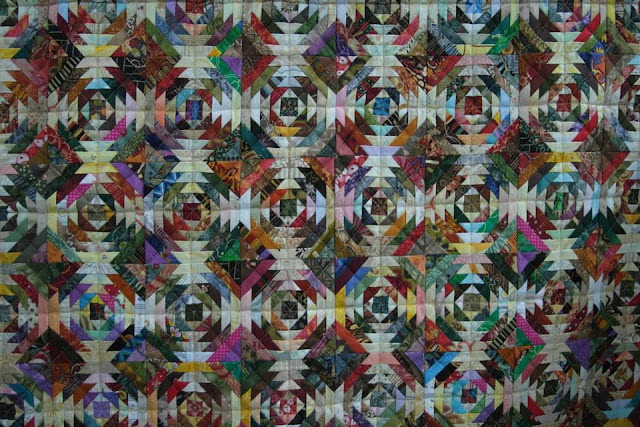 Jenny's quilt measures 108" x 140", and she did this in just 5 months. And just in case you're trying to do the math...these blocks are 4" finished. 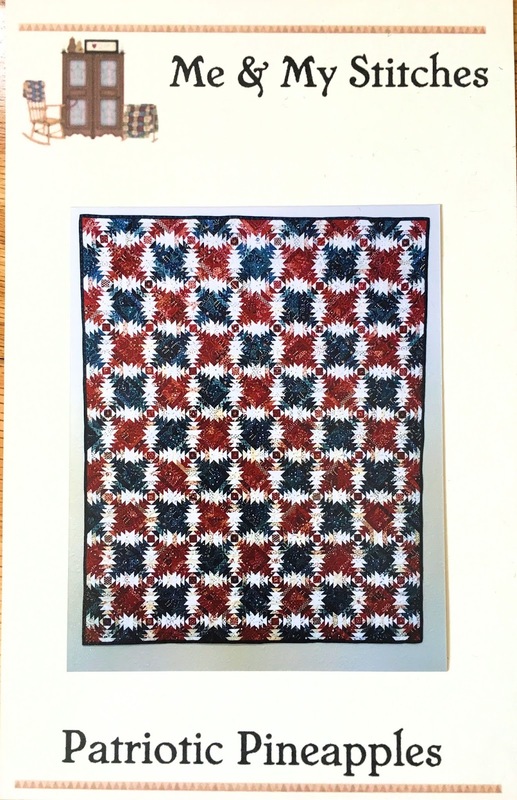 So let's back up...my little Patriotic Pineapple quilt finishes at 32" x 40". Sad, now that you know about Jenny's monster quilt! When I designed this quilt, I really wanted to make it BIG - I thought it would be so striking and cool, but there is just never enough time. I wanted to have the pattern ready for an upcoming show, so I had to be realistic and just make a wall hanging size. I am soooooo happy that Jenny made a huge one! And now be ready to be awed! Look how beautiful! Jenny entered her monster quilt at a show put on by the Hill 'n Hollow Quilt Guild in Mountain Home, Arkansas. 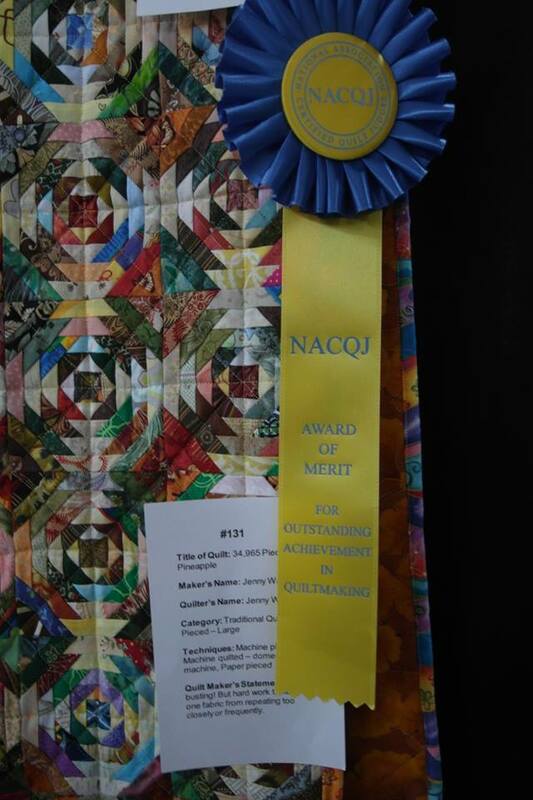 The judge, who is a member of the National Association of Certified Quilt Judges chose Jenny for a much deserved merit award. And are you ready? Here is the whole thing with Jenny - look how huge it is! I LOVE IT!!! 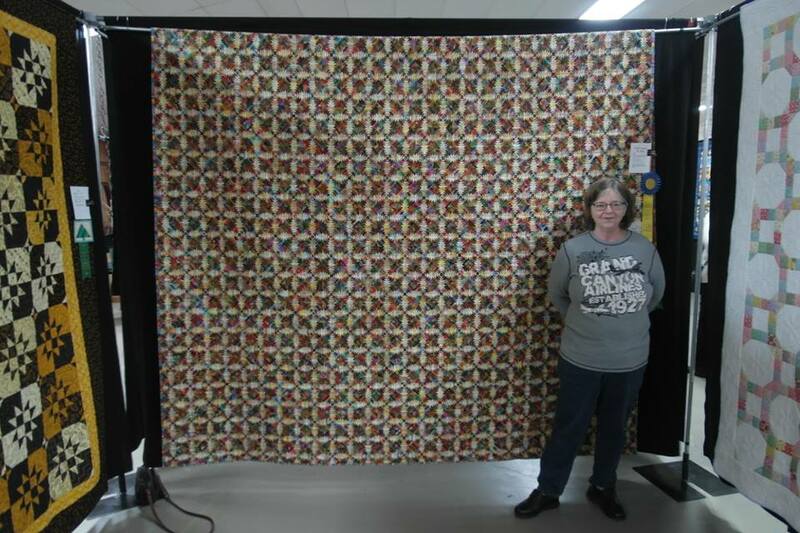 I hope to see this beauty (the quilt and Jenny - lol) in person at the Springfield, MO show next year. So....if you are inspired to make this, or some other size of this...you can find the pattern on my website. And no matter the size - I want to see it! 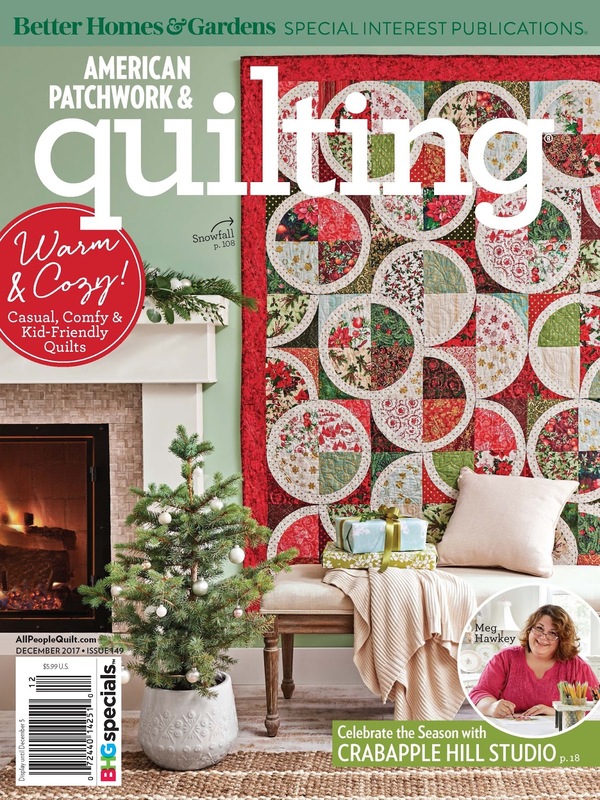 The very first magazine that my quilt jewelry ever appeared in was American Patchwork & Quilting - and that was in the December, 2010 issue (I have a box of them, if you need one - lol!). 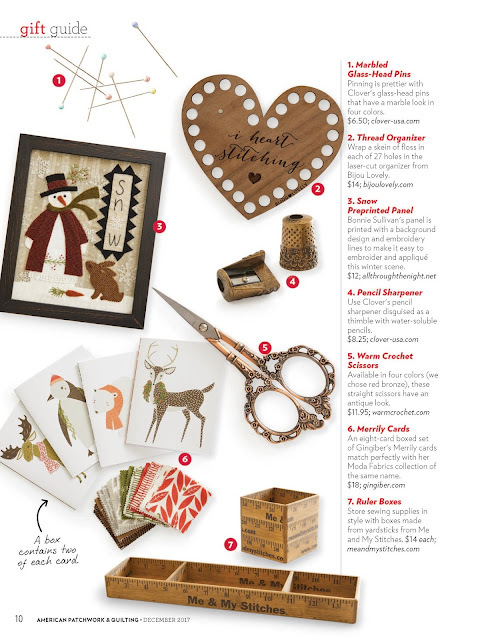 I was so excited to be published in their magazine and we had tons of orders because of it. We had just (and I mean JUST) gotten our website up and running before the magazine came out, so I know that basically all of the orders in the first 3 months were because of this. 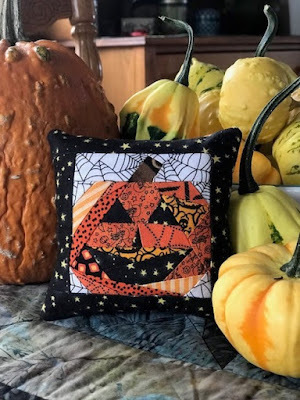 It was such perfect timing - it was available at the beginning of October - just in time for Christmas shopping! I was still working at a full-time job, as HR Manager, and let me tell you - it all kept me hopping! My mom was still doing the glass work for me. I would work at that pesky job all day, then piece little tiny quilts for jewelry in the evening and on the weekends. I would mail them to Mom on Monday (we live about an hour apart), and she would finish them for me. Then a lot of times, on my lunch hour, Mom and I would meet halfway, often she would bring us a little lunch, and we would sit in her van and eat our lunch, chat and look at the finished product. Then back to work I went. It all kept us very busy and I feel like AP&Q really helped me get a good start with my online business, and I am so thankful for that. Since then, my jewelry, pin cushion patterns, scissor hives and most recently our little ruler boxes have been published in 9 more magazines! Crazy!! I am so humbled and thankful every time I receive a request from one of them. Here is a list of the different magazines we've been in - American Patchwork & Quilting, Fons & Porter (a couple of times), Simple Quilts & Sewing, McCall's Quilting, Quilts & More, Quilter's Newsletter, Quiltmaker, and McCall's Quick Quilts. I'm not sharing any of this to brag, by any means, I'm just sharing it because it's exciting to me, and amazing as well! Who knew that my little business would grow like this. I sure hoped it would, and I took a HUGE leap of faith when I quit that job "in town" and started doing what I love full-time. I am so thankful and grateful every single day! So...thanks to all of my customers for helping me live the dream! And if you want to get a copy for yourself (as always, there are lots of great projects in here!) - this is the front cover. Funny that this is exactly 7 years after the first publication with them, and again...it's the perfect time to get started on your Christmas shopping, and we are happy to help! You can see our little ruler boxes and much more on my website - so go take a look and get started on your shopping! Do you ever feel like you just never quite catch up on everything? Boy, I sure do! We have been busy, busy, busy! I've made tons of pumpkin pendants - these are 1" x 1 1/2" with bling. Cute, huh? My "Surprise" program filled up in just a few days - thank you to everyone who signed up. The first shipment has gone out. Here they are, all wrapped up and ready to go. This just kind of looks like a big mess - but here are the piles of goodies waiting to be packaged. Aren't these little chick pin cushions adorable? I just love them. Thread, rulers, chalk markers and magnets...oh my! 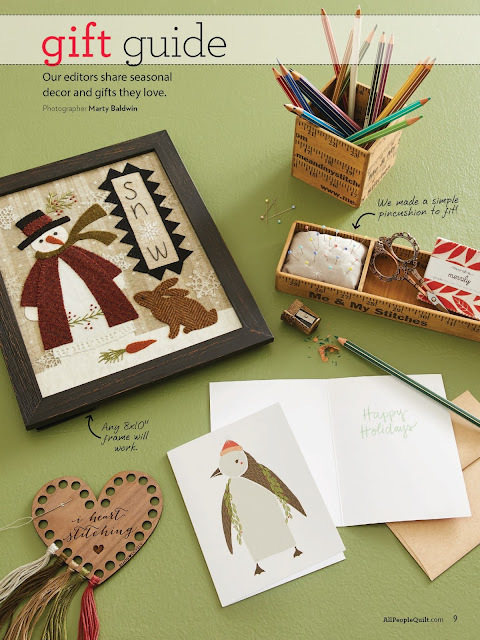 This is such a quick project, and perfect for this time of year. I was digging around in my totes that I keep all of my show stuff, in and found a few of these kits. I posted them on Instagram and quickly sold more than I had! So, I made up a few more! They are available on my website. I even have the Valdani perle cotton that you need for the wool part. If you completed the entire Minnesota shop hop, you received one of these flag pendants! I forgot to take a picture of them until I had already packaged up a lot of them - there were 100 total. This is a block of the month called Simply Vintage. I'm doing it through Sew Graceful Quilting. I'm trying so hard to keep up on this, but it's not working! Luckily they are pretty simple blocks. My dad has been in and out of the hospital lately, and even though it's not much fun for him, it has given me some extra stitching time! I've spent a few days just hanging out with him, stitching away. I've tried to tell him that I could teach him to stitch and he could help me out a little with all of these projects I have, but so far, he's not convinced. And now to update you on what the kitties have been up to. This one of Ozzie makes me laugh - he never lays on the ironing board and I'm not sure what possessed him to do it, unless he just thought that fabric needed some extra fur on it! Callie spends a lot of time on the ironing board - she likes to sit and look out the window (and put little nose prints all over the glass!). She must have also decided this block needed some fur! This happens several times a day...it means he is ready for a snack! And of course, I can't tell that cute face no! More sharing of the fur! I was trying to choose orange wool for some pumpkins I was making. It seems that Callie approved of the wool, but was not so happy about me taking her picture! And this is how Callie looks a good share of the time - mouth open ready to attack! She's such a little monster. This picture totally cracks me up. MEOW! I have lots of other news, and will try to post again soon!